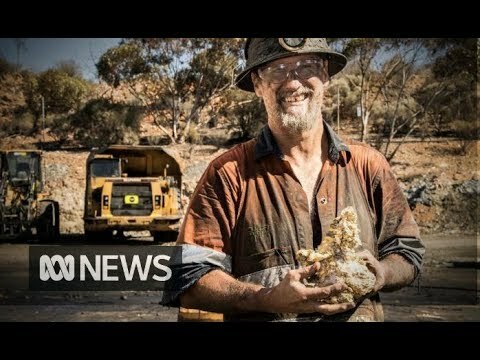 Gold rocks: Australia miners unearth ‘once-in-a-lifetime’ gold. Underground miners in outback Western Australia have unearthed rare gold specimens which geologists are calling a “once-in-a-lifetime discovery”. Workers at the Beta Hunt mine near Kambalda, 630km east of Perth, have brought more than $AU15 million ($NZ16.34 million) worth of gold specimens to the surface in just four days. The gold-encrusted rocks were found about 500m below the surface in an area just 3m-wide and 3m-high. The largest specimen weighs in at 90kg and took three men to lift it onto the back of a ute. The quartz rock is covered in an estimated 2300 ounces of gold worth about $3.8 million at today’s gold price. Another 60kg specimen is estimated to contain 1600 ounces, or about $2.6 million in gold. Senior geologist Zaf Thanos said in most mines around the world it was only possible to see gold through a magnifying glass. “You might go your whole life and you’ll never see anything like it. It’s definitely a once-in-a-lifetime discovery,” he said. “As a geologist, like I said, you get excited by a pinhead speck. But to see something on this scale is just phenomenal. The rich cluster of high-grade gold has so far produced more than 9000 ounces. When he came back to the same area for his next shift, Mr Dole thought it was business as usual. “Everything was covered in dust, and as I watered the dirt down there was just gold everywhere, as far as you could see,” he said. “I’ve been an airleg miner for 16 years. Never in my life have I ever seen anything like this. “There was chunks of gold in the face, on the ground, truly unique I reckon. The mine’s Canadian owners, RNC Minerals, are planning an auction for the large specimens. RNC president Mark Selby said collectors in north America and around the world are known to pay up to a 50 percent premium on the gold metal value for rare specimens. “Given the rarity of the rock, and the physical beauty and presentation of the gold that’s there, it’s a very spectacular stone in multiple ways so we’ll see whether 20, 30 or even 50 per cent premiums apply here,” he said. “We’re really looking forward to auctioning the key stones off over the coming weeks. “There’s a pretty select group of collectors who this would appeal to. Previous articleTotal tariffs threat China: surplus narrows, but not with the U.S.